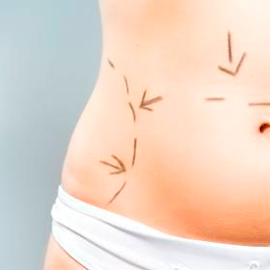 is a plastic surgery on body correction that removes isolated (local) pockets of fatty tissue from so called “fat traps”: abdominal area, thighs, buttocks, chin, back, knee and ankle joints. Even hard training and extremely strict diets far from always help to get rid of “excess” in those areas. In such cases, the method of surgical correction of the figure – liposuction is used. Vacuum (BodyTite) – the fat prepared with a special solution is mechanically destructed with a cannula for liposuction and extracted by the same cannula. РRadio-frequent liposuction – the fat is destructed with an ordinary cannula, and the skin is additionally treated with radio-frequent hand-piece. Liposuction in Clinic Estetic is always performed by a plastic surgeon who is a liposuction surgery specialist. The surgery is performed under the local anaesthesia and in a couple of hours patients can leave the clinic, and in 1-2 days start their work. If desired, the operation can be performed under general anaesthesia. A surgery used to improve the contours of the abdomen after pregnancy or significant weight loss. Abdominoplasty (tummy tuck) is a surgical removal of excess skin and adipose tissue from the anterior abdominal wall. Typically, those excesses are located in the area below the navel and sometimes form a dangling skin-fat fold. During the operation a scar after a cesarean section can be used. In some cases, the divergence of the rectus abdominis which often occurs after pregnancy and childbirth is fixed. The incision is located in the lower part of the abdomen and has and arcurate shape, its length depends on the amount of the excess skin and fat to be removed.